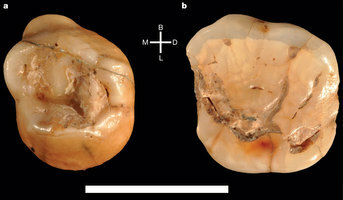 I just stumbled upon this BBC article that explains how an Apulian baby tooth (Grotta del Cavallo) and an English adult jaw fragment with three teeth still in (Kents Cavern) it are the oldest known remains of the ancestors of modern Europeans. Until now this honor belonged to Oase 1, a jaw from Romania with no clear industrial associations, dated to either 35,000 or 40,500 BPcal. Interestingly the Apulian baby tooth may be as old as 45,000 years ago, calling into question potentially the Neanderthal manufacture of Uluzzian industry (supported only by teeth like this one, now demonstrated to be ‘sapiens’ in fact), which marks this period and the pre-Aurignacian transition between MP and UP in South Italy (Neanderthals in Central Italy retained Mousterian while the North was dominated by proto-Aurignacian, possibly of ‘sapiens’ manufacture). The Kent jaw fragment, dated to c. 41,000 years ago, is more consistent with the dates of expansion of our species in the context of the HE4 cold snap and Aurignacian spread to the Franco-Cantabrian region, which took place c. 41-40 Ka ago (although it may have got some precursors, as suggested by very old proto-Aurignacian dates in Iberia). Both pieces have been known for decades but only now scientists have been able to research them adequately, it seems. The appearance of anatomically modern humans in Europe and the nature of the transition from the Middle to Upper Palaeolithic are matters of intense debate. Most researchers accept that before the arrival of anatomically modern humans, Neanderthals had adopted several ‘transitional’ technocomplexes. Two of these, the Uluzzian of southern Europe and the Châtelperronian of western Europe, are key to current interpretations regarding the timing of arrival of anatomically modern humans in the region and their potential interaction with Neanderthal populations. They are also central to current debates regarding the cognitive abilities of Neanderthals and the reasons behind their extinction1, 2, 3, 4, 5, 6. However, the actual fossil evidence associated with these assemblages is scant and fragmentary7, 8, 9, 10, and recent work has questioned the attribution of the Châtelperronian to Neanderthals on the basis of taphonomic mixing and lithic analysis11, 12. Here we reanalyse the deciduous molars from the Grotta del Cavallo (southern Italy), associated with the Uluzzian and originally classified as Neanderthal13, 14. Using two independent morphometric methods based on microtomographic data, we show that the Cavallo specimens can be attributed to anatomically modern humans. The secure context of the teeth provides crucial evidence that the makers of the Uluzzian technocomplex were therefore not Neanderthals. In addition, new chronometric data for the Uluzzian layers of Grotta del Cavallo obtained from associated shell beads and included within a Bayesian age model show that the teeth must date to ~45,000–43,000 calendar years before present. The Cavallo human remains are therefore the oldest known European anatomically modern humans, confirming a rapid dispersal of modern humans across the continent before the Aurignacian and the disappearance of Neanderthals. I am not sure at the moment but the Kent finding may also challenge the Neanderthal attribution of the Lincombian industry. The earliest anatomically modern humans in Europe are thought to have appeared around 43,000–42,000 calendar years before present (43–42 kyr cal bp), by association with Aurignacian sites and lithic assemblages assumed to have been made by modern humans rather than by Neanderthals. However, the actual physical evidence for modern humans is extremely rare, and direct dates reach no farther back than about 41–39 kyr cal bp, leaving a gap. Here we show, using stratigraphic, chronological and archaeological data, that a fragment of human maxilla from the Kent’s Cavern site, UK, dates to the earlier period. The maxilla (KC4), which was excavated in 1927, was initially diagnosed as Upper Palaeolithic modern human1. In 1989, it was directly radiocarbon dated by accelerator mass spectrometry to 36.4–34.7 kyr cal bp2. Using a Bayesian analysis of new ultrafiltered bone collagen dates in an ordered stratigraphic sequence at the site, we show that this date is a considerable underestimate. Instead, KC4 dates to 44.2–41.5 kyr cal bp. This makes it older than any other equivalently dated modern human specimen and directly contemporary with the latest European Neanderthals, thus making its taxonomic attribution crucial. We also show that in 13 dental traits KC4 possesses modern human rather than Neanderthal characteristics; three other traits show Neanderthal affinities and a further seven are ambiguous. KC4 therefore represents the oldest known anatomically modern human fossil in northwestern Europe, fills a key gap between the earliest dated Aurignacian remains and the earliest human skeletal remains, and demonstrates the wide and rapid dispersal of early modern humans across Europe more than 40 kyr ago. No mention of Lincombian, just early Aurignacian. Did homo sapiens outnumber Neanderthals 9 to 1?